The Allison Arms, Glasgow, G41 2AD. The Allison Arms pub review, map and rating. 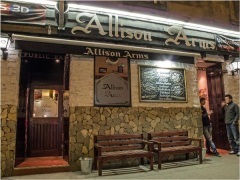 Looking for a Hotel near The Allison Arms? Huge selection of German and Scottish craft beers. Best in the South Side of Glasgow and the prices are better than most!